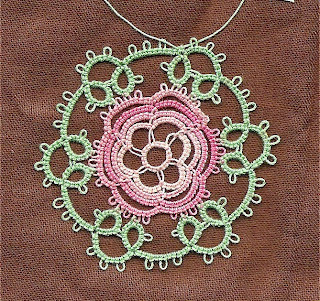 This was going to be the square motif, but for a square the rose needed eight petals. I didn't work that out until I was working the green bit and needed to make a corner. The problem for me is I tend to glance at a pattern and memorise it, because I don't like carrying books around, but some patterns need a bit more concentration than that. Still, this result is pretty enough, and I know where I went wrong for next time. 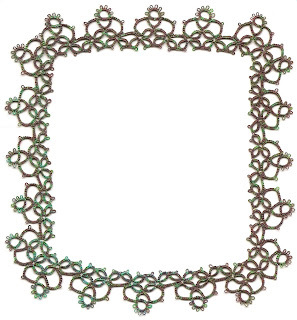 On Saturday I have a lace workshop, which I am really looking forward to. We are making lace straps, for a top. I will take my camera. Your rose is beautiful! 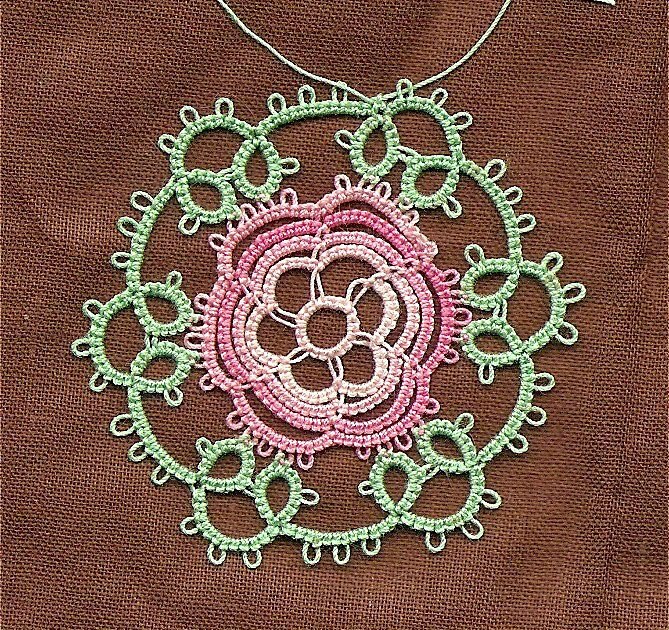 I think I would have made six petals as well, and therefore not had enough to make a square! I wish I had the ability to memorize a pattern quickly. Just about the time I think I have it memorized is when I get it all wrong! Your edging turned out incredibly well, it's just beautiful. I love the subtle colors of the thread. As for the Rose piece, there must be something just as useful for 6 sides as 8, because it's a pretty design. It looks like it goes with the edging you did for the sachet, so you could add it as a motif in the centre. Sharon, I also thought about decorating the sachet with the rose, because I do think it is pretty. I am keen to give that square another go, because I love your design. Diane, I know so well what you mean about memorising things wrong, the worst is when you put it down for a few days, then pick it up again, thinking you know what you are doing, only to get it completely wrong! Marty, thank you, I love the thread, it is unusual, sort of mottled...and of course Mary Konior is/was so good at designing. Both the rose and the edging look wonderful. Even if it's wrong, the rose looks good, just not square. I'm looking forward to seeing the sachet when you get it done. My first ever lace lesson!